Get in touch with us 24/7 and share your removals needs. We will provide you with a free quote shortly after we receive your detailed requirements. You may book the moving supplies delivery and our packing assistance separately or together with one of our removals service options. You can also schedule a partial packing service if you need some extra help with boxing easily breakable items, for instance. The price will be calculated per box and will be included in your final quote. To help us with the estimation of the price, we may ask you to do a video survey with one of our sales operators - it's an easy and comprehensive process that is very time-efficient. Depending on the size of the packing/removals job, we may deliver your moving boxes and packaging materials a few days prior to Moving day or on the very same day of your relocation. Make sure that you’ve sorted out a valid parking space in advance. 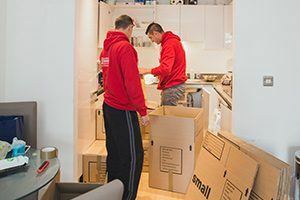 We have partnered with popular suppliers who offer only high-quality removals cardboard boxes of different sizes, as well as various sturdy wrapping materials. Upon request, you will be provided with carton garment carriers, which can fit up to 30 hangers for your clothes. We recommend that you order some extra packing supplies, just in case, even if you end up not needing them. Note that you won’t be charged for any unused packaging, which will be collected by the packers at the end of the service. On the day of your appointment, the professional packers will arrive fully prepared to get on with the professional packing service. They will assemble the boxes and start wrapping every item with utmost care. Each filled-up box will be secured with a vinyl tape and labelled appropriately. Fragile items will be protected with bubble wrap and encased in timber crates if requested. The professional packers and movers will cover any soft pieces of furniture with a plastic sheet. And rest assured that all your movable property will be fully insured from start to finish! The multi-skilled movers and packers will load your stuff into the vans securely and efficiently. They will use ropes for extra protection and moving blankets to prevent furniture from getting scratched. During transportation, the drivers will rely on their GPS systems, in order to deliver your load via the most direct route. At the new location, your belongings will be unloaded diligently and placed carefully in each room, completing the packing and moving service with great care. Should you need assistance with unpacking your stuff, it can be arranged, too. Packing and unpacking can be a tiresome and stressful task. And we can take away this hassle from you. If your move is stressful enough already, then you can delegate this chore to us and we'll gladly help. And if you have any specific instructions, just let us know and consider it done. Fantastic Removals uses only high-quality and eco-friendly cardboard boxes of different sizes and a wide range of other packaging materials. From bubble wrap and clear film wrap to moving wrapping paper and vinyl tape, we will deliver everything together with a sufficient number of boxes to your address. Unpacking at your new address and arranging your things can be a fun exercise. And it will be so easy when everything neatly packed and labeled. But hey, if you don't have the time to do it, then again, this is something you can leave to the removal specialists. We are here for you, all week long. Check out our prices and availability to arrange your service. Often you can benefit from a same-day and next-day service as we are quite at efficient at what we do, even if it is the weekend or an official holiday. Get all the packing materials you need at an even better price by trying out our Fantastic Membership plan. As a club member, you will instantly receive preferential booking treatment and a 10% discount on all removals services on our catalog, as well as on end of tenancy cleaning, landscaping, handymen, and other home and business solutions. As if you haven’t got enough on your plate when you prepare to relocate your entire three-bedroom house together with the overwhelmed kids… So, why not trust our packing expertise and leave the wrapping of each and every toy, book, plate or light bulb to us? We know what we are doing because we’ve done it a hundred times. We can even help you with creating a moving checklist. Just ask! We offer all-inclusive international removals services, which factor in all aspects of your relocation. We will deliver all the required removals boxes and packaging supplies, as well as pack and label your belongings prior to loading. We do this to avoid implications with customs and prevent the risk of your items getting damaged during the long-haul journey. Moving your office? Or you are shifting equipment to a newly opened branch? Then, let us handle everything for you, while you focus on more important endeavours to grow your business. The last thing you want is to appoint members of staff to pack your goods or office furniture when they should be performing their job responsibilities. This can only increase your total packing services cost in the long run. Note that regular commercial clients enjoy our removals services at preferential rates. Packing and moving art from A to B requires experience, strong attention to detail and expertise. The same applies to antique artefacts and fragile items. Our packing services can accommodate various special-care removals needs, whether you require transporting an old wall clock, an expensive oil painting or a precious musical instrument. Your valuables will be packed and labelled professionally and will travel under full insurance. Make the packing easier by making a stack of belongings according to the room they belong to. Avoid things like having cosmetics in the bedroom. This will only slow down the whole packing and moving process. Clutter will only slow you down during the packing process. Make sure you have removed anything that won't go into the new home. You can give, sell or throw away the rubbish you no longer need. Get a precise estimate on the number of moving boxes you will need. If you get less than the necessary there is a chance you will waste a day or two until you get more. Don't worry if you order extra boxes, most company will collect what remains untapped. Q: Can I use my own packing materials, boxes and cloths for padding my stuff? A: Well, this is up to you but you should consider doing the packing as well. We execute our packing services with packaging materials that are sourced from popular suppliers and come with a quality guarantee. Also, we cannot be held responsible for damaged items during transportation if old boxes and improvised materials have been used to pack your load. Q: Does the packing service come with a full insurance? Q: How long before moving day would the packing service take place? A: This will depend on the size of your property. We prefer to have enough time to react to unanticipated events during the preparation stage of your relocation. With small moves, however, the packing can be easily done on the same day as the loading. The same applies to overnight removals. Q: Can you pack and move valuable items? Q: Can you assemble my furniture after unpacking? A: Yes, this is included in your removals service. Q: So, I need to book the packing service at the same time as ordering the removals boxes? A: If you want us to pack your stuff, we will include the moving boxes delivery in your quote. 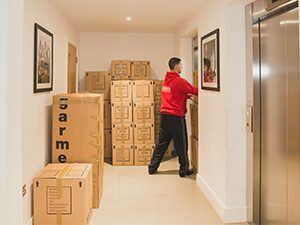 You can always book a packing service later if you haven’t done so when scheduling your removals service or boxes delivery with us. Q: Can you dispose of the packing materials after unpacking? A: Yes, we can offer you a waste disposal as a separate service. Q: I’ve got my own van to move my belongings but I don’t have the time to pack. Can you help? A: Sure. Feel free to order only the removals supplies and the packing service if this is what you need. Q: Upon moving in, can you plug in all my appliances? A: This can be done upon request but you'll have to sign a damage waiver form. Q: Are there any appliances that you are unable to connect? A: Yes, hardwired ovens/hobs, and gas-based appliances. Book Packing Service for Your Move Now! Fantastic Removals specialize in the delivery of professional removal services. Copyright © 2013 - 2019 By Fantastic Removals.